Still thinking of the guy at the salon with bumpy ears like Randy “The Natural” Couture? He may be suffering from Cauliflower Ears, an obvious off-shoot of countless boxing matches. Read on to know all about Cauliflower Ears. 6 How to prevent Cauliflower Ear? People with Cauliflower Ears may experience a throbbing pain in their ears till sometime after the condition is caused. In most cases, there is a swelling in the ears in the early days of the condition. A trauma to the ear can impair the adjoining blood vessels. This can result in internal leakage of blood. The blood may leak into the outer ear tissues and form clots. This blocks nutrition to the ear cartilages. In case of an ear infection, pus may build up between the cartilage and the skin. If there is a cut in the affected ear, there may be a leakage of pus resulting in much discomfort in the person. Sufferers may also experience a warm feeling in the affected area. There may be tenderness in the ears several hours after the condition has been caused. The condition may cause the tissues in the affected ear to become stiff. 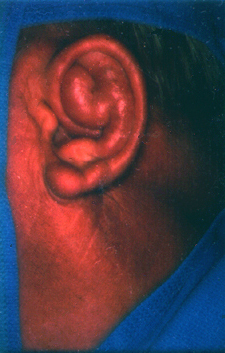 The skin in the shrivelled up ear becomes pale in the absence of blood supply. If there is excessive inflammation in the fibrous connective tissue membrane of the cartilage surface, the person may suffer from problems in hearing. An infection occurs when the connection between the ear cartilage and the skin is disrupted. As you might have guessed, the condition is mainly caused by trauma to the ear. Ear trauma is common in contact sports like boxing where repeated blows to the ears give them a deformed appearance. When the ear receives a hard blow, a blood clot develops under the skin and blood supply is mostly cut off to the cartilage. The lack of blood supply may cause the ear cartilage to die. It is the cartilage that gives shape to the ear. In the absence of the cartilage, the ear loses its firmness and shrivels up to appear as a lump. This increases the risk of ear infection. The tearing away of the ear skin from the cartilage can also cause the same damage as a hard blow. In both cases, damage to the ear can obstruct blood flow to the cartilage resulting in its death. Piercing the cartilage can also be one of the causes of Cauliflower Ear. This however, occurs very rarely and cannot be held as a major reason behind the condition. If you have got Cauliflower Ear, you must get it treated as soon as possible. Medically treating Cauliflower Ear involves curing Hematoma or the blood clot that usually accompanies the condition. This is effective if you visit a doctor immediately after a blood clot has formed following a trauma in the ear. The affected region is made numb using local anaesthetic. Blood is then drawn out from the clot with the help of a syringe. The skin is reconnected to the cartilage with a tight bandage. This keeps blood flow to the cartilage normal and reduces chances of Cauliflower Ear formation. Delay in Cauliflower Ear treatment can lead to a hardening of the ear and make it permanent. It may even result in more severe complications like infections. Infections are generally treated with the help of antibiotics. There may also be an accumulation of pus or fluids in case of an infection. Treatment of infections is generally done by draining Cauliflower Ear. If the skin in the ear is badly torn, it needs to be stitched back in place. Cauliflower Ear generally involves formation of a blood clot in the ear. If the blood clot is not timely removed, it can lead to scarred tissue and a permanent odd shape of the ear. This is why draining it is so important. Draining cauliflower clots is done by doctors who have the necessary expertise in treating the condition. Doctors use a sterilized needle to make a small hole in the affected area. This draws out the excess fluid from the clot and aids in its recovery. Painkillers are also administered to help the person recover faster and provide him with relief from pain. If the blood clot is removed on time, an operation has to be carried out to restore normalcy to the ear. In some cases, a plastic surgery is done on the affected ear to reduce chances of further pus leakage. How to prevent Cauliflower Ear? If you do not want to carry around a Randy Couture cauliflower ear around your face, you can try these simple steps to prevent the condition. Contact sports practitioners often wear headgear known as “scrum caps” to protect their skull and facial organs. You can wear these to protect your ear from an injury. If your ear suffers an injury, immediate use of ice packs over the affected area should prevent the shrivelling up of the ear. An immediate use of Pressure Bandages over a just injured ear can also help you avoid the condition. Here is some helpful Cauliflower Ear images that will help you know how the condition looks like. Go through these pictures of Cauliflower Ear and have a proper understanding of this unique condition. If you have injured your ears, it is best to get medical treatment as soon as possible. Timely treatment by an expert medical professional will help you avoid complicated conditions like permanent scarring, infections and even loss of hearing. Delay in treatment of the disorder will only make managing it more difficult for you and leave no other option but Cauliflower Ear surgery. So it is better that you act sooner.